A deal sealed in San Francisco could create 100 jobs at a Carmarthenshire firm, the Welsh government says. Hydro Industries has announced a joint venture with US firm T&T Salvage - one of the worlds' largest salvage companies. Based in Llangennech, near Llanelli, Hydro Industries makes products for water purification. 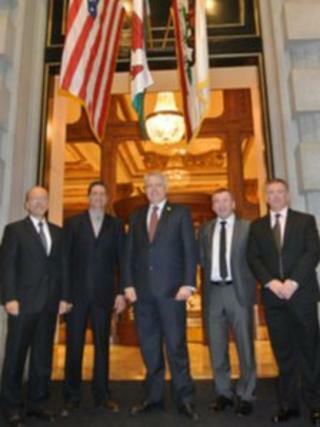 The deal was sealed in the presence of the First Minister Carwyn Jones during his trade mission to California. Mr Jones has said he hopes to open doors for Welsh businesses during the four-day visit. Representatives of 18 IT, science and creative businesses arrived in California with him on Monday. "The Welsh government is delighted to have worked closely with Hydro Industries in Wales and will continue to support them in their joint venture with T&T Salvage and their continued growth as a company in Wales," said Mr Jones. "I welcome this new venture involving two companies that between them have the potential to bring about real environmental benefits through mitigating the damaging effects of disasters, whether they be natural or man-made. "This agreement today will not only launch Hydro into the US emergency response arena - a truly significant market - but will also generate a good number of high quality jobs in Wales." Hydro Industries is a high-tech company specialising in the design, manufacture and operation of electro-based water treatment products. The company will be supplying some of its products to T&T Salvage and undertake research and development of new bespoke products for the US company. Wayne Preece, chief executive of Hydro Industries, said: "The joint-venture is a genuinely exciting and innovative collaboration. "We've established ourselves in a short time as leaders and innovators in environmental marine technology and it is a great privilege to work side by side with a market giant such as T&T. "This new relationship provides a great opportunity to strengthen and develop our technological capabilities and grow the business. "We are delighted that Hydro Industries is leading the way in forging global networks in an area that is so important to the future of us all."